Taylor has won over 70 main events between 1999 and 2010! Taylor competed in the NASCAR K&N Pro Series West and had two Top 10s this year. He was also a Sunco Rookie of the Year Candidate. Taylor finished 3rd out of 27 drivers for 2009 with a total of 399 points for 14 total races. He placed in the top 5 in 12 out of 14 races and in the top 10 in 13 out of 14 races. In 2008, Taylor won his first three races and earned contention for the points championship in the NASCAR Super Late Model. Taylor won the Fall Classic at the Las Vegas Bullring- finishing ahead of KYLE BUSCH in Super Late Model 140 main event. 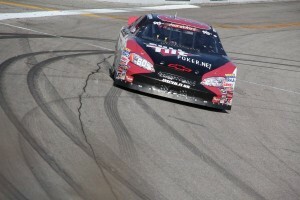 Taylor was chosen Las Vegas Motor Speedway’s Most Popular Driver. Taylor won 2 regular season Main Events, 3 Trophy Dash wins, and 2 Fast Time Awards. Taylor had 5 top fives, 6 top tens, 4 top fifteens, and 5 top twenties. Taylor Barton’s Rookie Season in NASCAR Super Late Model Competition. Taylor named 2005 Rookie of the Year, placing seventh overall in points. Taylor won eight Main Events, three Pole Positions in Pro Legend Division. Taylor won the Las Vegas Motor Speedway Pro Legends Track Championship. Taylor won the Nevada State Pro Legends Championship. Taylor was a National Runner-up in Pro Legends Competition. Taylor won more than 15 features in Semi-Pro Legends Division. Taylor won the Season Championship at Las Vegas Motor Speedway in GO Karts. Taylor won Rookie of the Year and Series Championship at Sloan, NV in GO Karts.